A wide range of techniques and talents were used to produce the 600 visual effects shots of FLUBBER. Among the effects created were flying cars, dancing goo, and flying basketball players--not exactly your average, run of the mill, effects film. In this behind the scenes look at the making of FLUBBER, you'll hear from the effects creators about their creative inspiration and technological advancements that helped them execute FLUBBER's ingenious effects. Participating in this article are ILM supervisors Tom Bertino and Sandra Ford Karpman, Dream Quest supervisor Doug Smith, POP Film supervisor Ken Littleton, and C.O.R.E. supervisor John Mariella. 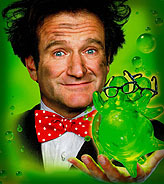 FLUBBER Stills ©Disney Enterprises, Inc. All rights reserved.